With rookie Terio Tamani coming in as a sub and switching Vilimoni Botitu’s position has been Baber’s only choice during the later part of the USA 7s and throughout the Can­ada 7s in Vancouver. Fiji Airways Fijian 7s head coach Gareth Baber is work­ing hard to determine the 13 or 14 players he needs to take to Hong Kong and the Singapore tour­naments. What has made the Welsh­man’s task much more difficult is the injury to Waisea Nacuqu, which has left a vacuum on the crucial playmaker’s role. After the Fiji Bitter Marist 7s, Baber was happy with the perfor­mance of Ratu Filise’s Amenoni Nasilasila, who is dropped from na­tional duties due to a pending court case. He also mentioned veteran Po­lice Blue captain Livai Ikanikoda, who plays equally well at halfback and first five. Ikanikoda’s superb performance was because of his combination with playmaker Meli Kurisaru, who had excelled in controlling the pace of the game. Kurisaru, who is a for­mer Nadroga and Suva utility back, is also good with his kicking game and is an accomplished goal-kicker. His only blemish in the Cup final was a shoulder charge that saw him cop a yellow card, which is some­thing that we cannot afford in the HSBC World Sevens Series. The Hong Kong and Singapore tournaments are crucial for us to win if we are to claim the 2018/19 World Sevens Series or get a top 4 finish in the Series to qualify for the 2020 Olympic Games in Tokyo, Ja­pan. Baber and his coaching staff are going to bite the bullet and make some tough decisions on who is go­ing to be our playmaker and also on the state of our injured players. They cannot afford to take injured players with them or even those who are not 100 per cent fit. With the abundance of talents there is no need to press the panic button but for Baber & crew to plan well and most importantly have con­fidence on our new talents as they are very much capable of rising to the occasion. On the players they’re going to name today let’s wish them well and offer them our whole hearted sup­port. MY PICK: Paula Dranisinukula (Cap­tain), Josua Vakurinabili, Meli Der­enalagi, Mesu Kunavula, Sevu Mocen­acagi, Jerry Tuwai, Terio Tamani, Vilimoni Botitu, Aminiasi Tuimaba, Rusiate Matai, Alosio Naduva, Kalione Nasoko, Napolioni Ratu, Apenisa Cakaubalavu. Edinburgh have completed the signing of Fijian 7s captain Kalione Nasoko on a two-year deal. The 6ft 3in, 92kg flyer– who was named in the HSBC World Rugby Sevens Series Dream Team in both 2017 and 2018– will join the club in the summer. “I’m very excited by the opportunity to join Edinburgh,” Nasoko said. “I am friends with Viliame Mata and he has said great things about the club – I can’t wait to get started. 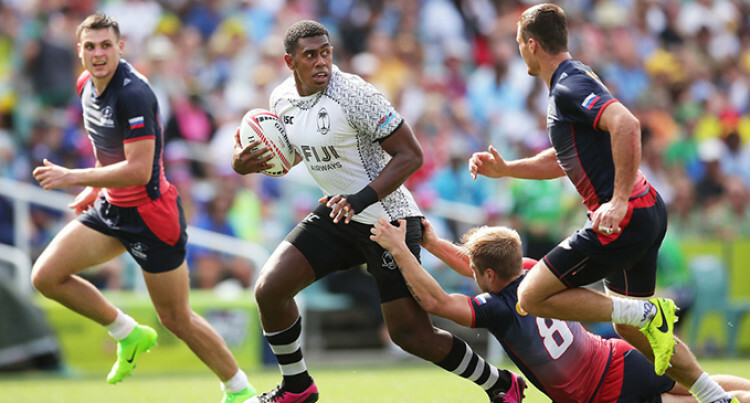 Head coach Richard Cockerill, added: “Ka­lione is a tremendously exciting player who is obviously captain of the Fiji Sevens side. He’ll predominantly play as a winger, but he has also played at 13. Perpignan winger Eroni Sau has also signed for Edinburgh for the next two years. Nicknamed ‘The Sledgehammer’ due to his fe­rocious attacking and defensive play, Sau made his Fijian sevens debut in 2017 and an immedi­ate impact on the World Rugby Sevens Series earned him the Rookie of the Season title and a place in the overall Series Dream Team. “After speaking with Richard Cockerill and my friend Viliame Mata, I knew it would be a great move for my rugby career and also for my family. I can’t wait to work hard in the summer to earn a place in the team next year,” Sau said. Cockerill said anyone who has watched 7s will know Sau. He’s a very strong and powerful runner, he’s tough and very combative. Sau initially made his way in rugby league playing for Saru Dragons. After a brief spell playing in the Cook Islands, the winger was encouraged to take up rugby union where he played for Police, Suva and the Fiji Airways Fijian Drua in fifteens rugby.